Representative Honours: Northern Ireland: 3 Full Caps (1954-1955), 5 Amateur Caps (1948-1950); Irish League: 6 Caps (1949-1955). 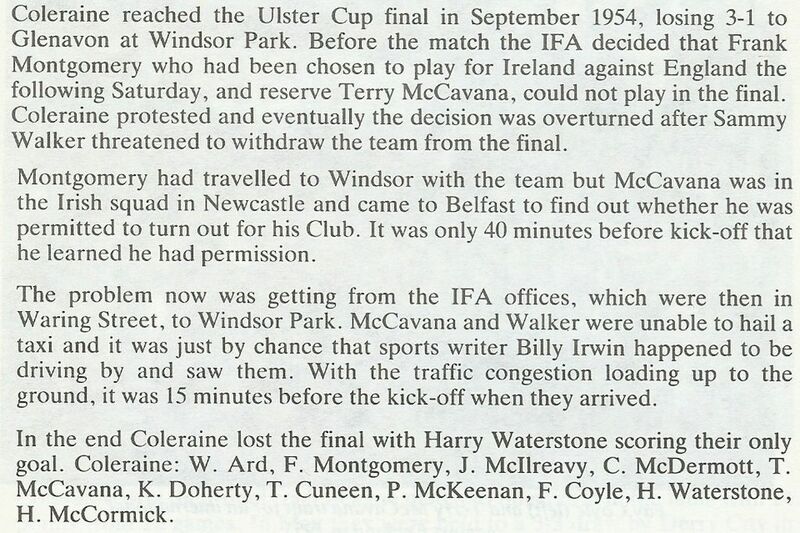 Club Honours: (with Coleraine) Irish Cup Runner-Up 1947/48, 1952/53; City Cup Winner 1953/54; North-West Cup Winner. An amateur with Coleraine in the late 1940s, Terry McCavana was posted to Newton Aerodrome with the RAF. 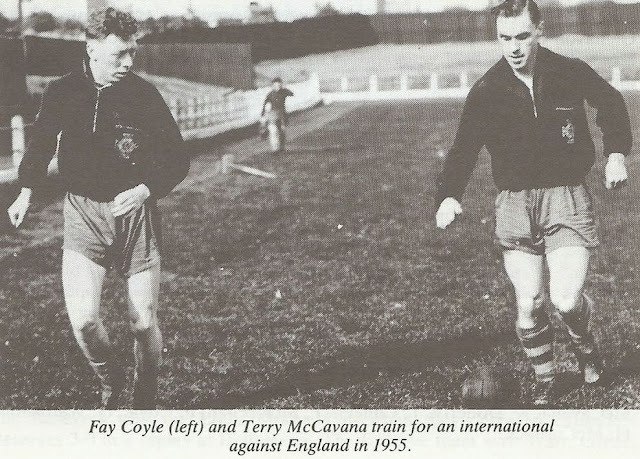 Obviously unable to continue his Irish League career, McCavana secured his release from the Bannsiders to sign amateur forms with Notts County in August 1948. A stuttering start at Meadow Lane saw McCavana suffer a muscle strain on his reserve team debut and then break a leg. 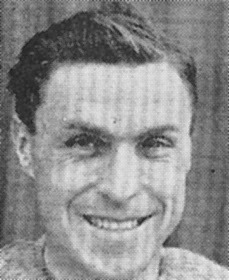 He finally made his League debut in a 2-1 win over Leyton Orient in April 1949, and by the end of the season had made three appearances at right-back. 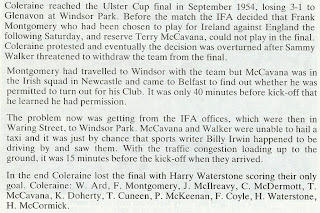 After his demobilisation McCavana returned to Coleraine where he was quickly recognised by the Irish League, playing against the Scottish League in September 1949. Through the fifties he established himself at centre-half for Coleraine, the Irish League and the Northern Ireland Amateur side. 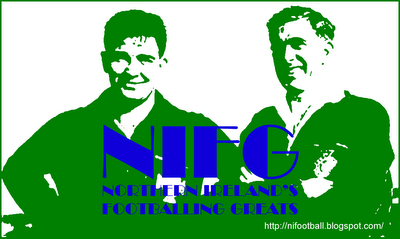 In November 1954 he was awarded his first Full cap as stand-in centre-half for Jackie Blanchflower. In total he won three caps, twice against Scotland and once against England. 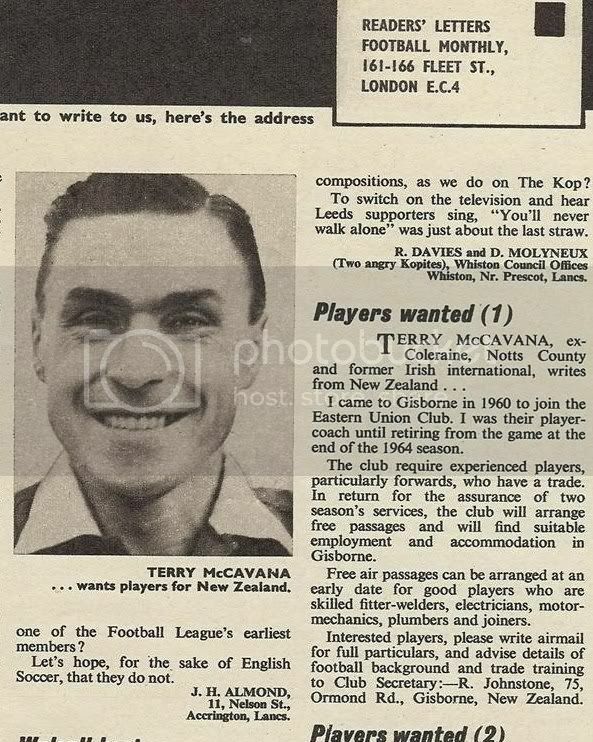 Later McCavana would settle in New Zealand where he played an active role in attempting to establish football in the country through the 1960s and ‘70s. He remained in New Zealand for the rest of his life, passing away in Auckland at the age of 94 in 2015. Summary: 5/0. Won 2, Drew 1, Lost 2. Terry McCavana is alive and well and living in Auckland, New Zealand. He said recently he never saw himself play. Does anyone know if there is any film footage of games he played in? Go the Pathe Newsreel site. There is certainly footage of the match between Scotland and Ireland at Hampden Park on November 3, 1954, in which Terry McCavana played. (It was a 2 - 2 draw.) He may well appear. Terry is living in manurewa, Auckland and plays indoor bowls. Terry will be 91 in january,, and still fit as a fiddle and carving up at lawn bowls!! Hats off to you Terry!